Return battle! Black Waltz No. 3 is a pretty simple combatant this time around. It continues to rely primarily on magical attacks, hitting one character at a time, though it never does enough damage to kill in even two hits. 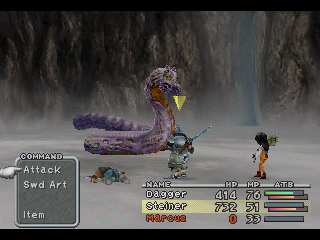 Heal with Dagger while Steiner and Marcus beat it down. You cannot lose this battle, as the Black Waltz will simply never attack Dagger. 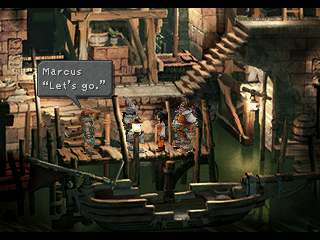 Marcus can Steal a Steepled Hat, a Lightning Staff, and a Flame Staff from Black Waltz No. 3. You can make two little side trips on your way to Treno. The first takes you back to Dali, where you can snag a few more items. You'll find the gate to Dali to the left at the crossroads north of the cable car station. Dali is largely unchanged, though you can now get at the treasure chest previously being blocked in the village's small, rear field. The chest contains an Elixir. There's also a great deal of new dialogue with the villagers. The second side trip is on the road to Treno. After emerging onto the world map again, walk as far east as you can go, well past Treno and through a forest. You'll find a small cave called Quan's Dwelling. You can find an Ether along the initial path if you head all the way east, another Ether on the lower level, accessible via a rope and beside a health-restoring hot spring, the Scorpio Stellazzio in a small niche just south of the spring, and a third Ether in a rear room, up a ladder. You can also find an indication of who lived here by checking the rear wall of this back room. Right at the entrance of Treno is a small fountain, on the left of the screen. You can throw gil into it at allotments of ten. Throw gil into the fountain enough and you'll receive the Gemini Stellazzio. More on Stellazzio in a few paragraphs. Head west from the entrance of Treno to find a tower. Check the chest outside the tower for a Mythril Dagger. You'll enter the tower soon enough. On the lower level of Treno, accessible from the east and west via stairs, is a Card Stadium. Here you can compete in Tetra Master battles for prizes. You'll wind up here as part of the storyline much later in the game. You can enter a sort of red-carpeted tunnel to the west of the Card Stadium. The four-armed man who stole from Dagger is here, and if you speak to him before he walks past he'll panic and give you a Power Belt. He'll only do this if you watched Treno Tradition. There's a Synthesis Shop at the end of this path. Northwest of the Card Stadium is the home of Queen Stella, a collector of Stellazzio. She'll give you items in exchange for these Stellazzio. Up to this point you may have collected Aries, for which you'll get 1,000 gil. Continue returning here when you find Stellazzio for increasingly better rewards. Check this article for more information. 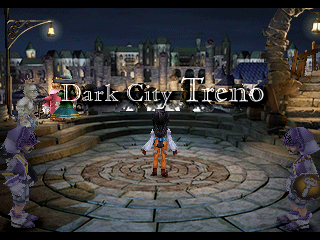 To the east of the entrance of Treno is a poor residential area where you can find an Inn and an Item Shop. Near the Item Shop are chests containing a Yeti Card and 1 gil. If you look behind the Item Shop you'll find the Taurus Stellazzio. In the far north, near the Weapons and Armor Shop, is the Treno Auction. 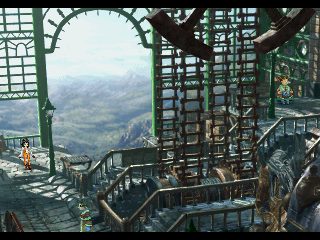 Look on the left side of the entrance for 2,225 gil, then head inside to find Dagger and proceed with the story. You can also stick around the Auction and bid for valuable items, though they're going to run you an awful lot of gil. We'll look at the Auction House in another article. - Once you have Dagger, head to the Inn in the east of Treno. Marcus is downstairs. Speak to him to gain access to an underground boat, then, after several cut scenes, head to the locked tower from earlier. Inside you'll receive Supersoft, and your new pal, Doctor Tot, will usher you into an underground passage. - First up: save Moogle. There are monsters down here, so you should save before exploring. - Second, it should be obvious by now that your 'B' team of Steiner and Dagger is weaker than Zidane's 'A' team. To make up for this there are large, easy-to-kill creatures called Crawlers in Gargan Roo that offer a nice amount of experience. If you want to get your main team up to snuff more quickly, knock out Marcus and let Steiner and Dagger soak up more experience. - Check the left path first. There are two chests out here containing a Chain Plate and a Phoenix Down. There's a lever here that will do something later. - Backtrack and take the right path. Head north to hit a cut scene, then hit a switch to call a Gargant, a big, insectile transport of sorts. Once the Gargant is circling the platform, run back south, as far as you can, and pull the 'Feed' lever to stop the Gargant. A cut scene follows, and so, too, does a boss battle. Marcus can Steal a Bone Wrist and a Mythril Fork from Ralvurahva. - A cut scene follows the end of Ralvurahva, and when it's done you'll be back in command of Zidane and company for a fair while.